I made some major changes to the first part of my route today. From my accomodation out of Grampound for the next couple of miles would have been uphill on the trunk road. I didn’t fancy that, so found a route, albeit longer and hillier, on quieter roads. This had many advantages: Safer away from the fast moving and heavy traffic, the roads aren’t mapped so far, so they’ll get added to the OSM data, and it landed me further south on another braid of NCR3, so I got some more of that mapped as well. Even then I got tempted to cycle a little further south still to the outskirts of Mevagissey on NCR3, simply because I stayed there a few years ago without a bicycle and wondered where the cycle route actually goes. Now I know. After my diversion to Mevagissey on NCR3 I retraced my steps, got tempted to follow the short cycle route off to the Lost Gardens of Helligan and back, and followed the route towards St. Austell. I then discovered another braid to Pentewan, gave in to temptation again, and followed that there and back as well before continuing as planned to St. Austell. In St. Austell I followed the NCR3 signing and found that I actually followed it a bit too far. NCR3 and NCR2 join at St. Austell. When complete NCR2 will roughly follow the south coast to Dover. I’ve followed large parts of the existing NCR2 in previous days in this trip. My plan was to follow NCR2 for a bit here. After a little searching I found the route and followed it through the Clay Trails. Unfortunately the signing was a little thin here, but there were just enough signs marked with NCR2 that I’m reasonably confident that I followed the actual route out of the possible permutations here. 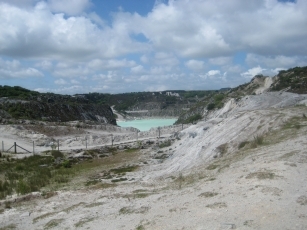 This route took me past some lakes that filled in some former clay works. The water colour has a green tinge here because of the mica particles in suspension in the water. 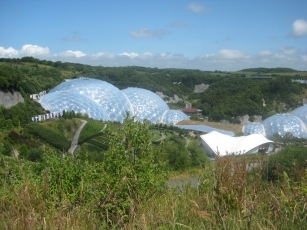 Eventually the Clay Trails route arrives at the Eden Project, itself sited in a former clay works. I once again got tempted to follow the cycle route down into the project then back out again, noting the presence of the cycle parking on the way. On my way out I met a young couple that were confused a little by the signing of NCR3 at this point. They were hoping to follow some of the routes to Mevagissey, etc. that I’d cycled a little earlier in the day. The map that they had wasn’t particularly detailed. So, having just cycled that bit myself I tore my own map page covering the area in half, such that they could use that for navigating around the Clay Trails etc. themselves. I also warned them about the thin signing, but gave them some clues as to the landmarks I used to find my way through. Hopefully they didn’t get lost. NCR3 then follows some extremely quiet roads towards Bodmin and a spur heads off towards Bodmin Parkway station, situated strangely a few miles outside of Bodmin itself. From the station I followed a small road out to the A38 trunk road, another one that I needed to include a few miles of in order to reach my accomodation. Actually it turned out to be pretty manageable, a good surface and reasonably flat. I then had a climb off of the road towards the A390 again, where tonight’s accomodation is situated. West Taphouse is a hamlet without a pub, so for tonight’s food I needed to make a 10 mile round trip to the town of Lostwithiel. 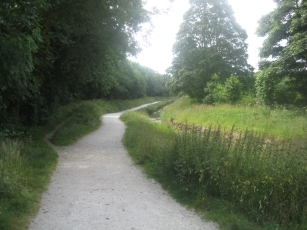 I cycled there and back mainly using quiet country lanes, taking a slightly different route outbound and for my return. All of the lanes weren’t mapped yet, so that’s another few miles of coverage for OSM. The bike felt quite strange this evening; I’ve obviously got quite used to carrying the extra weight now; I found myself slightly overcompensating on my balance whilst cycling this evening. This entry was posted on Saturday, June 27th, 2009 at 19:37 and is filed under Cycling. You can follow any responses to this entry through the RSS 2.0 feed. You can leave a response, or trackback from your own site.